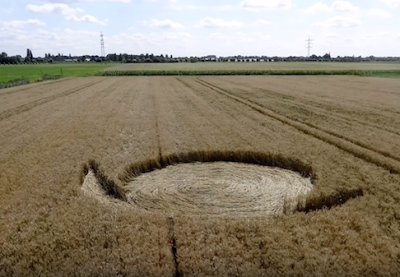 UFO SIGHTINGS DAILY: Crop Circle In Hoeven, Netherlands Shows Signs Of UFO Landing, July 2015, UFO Sighting News. 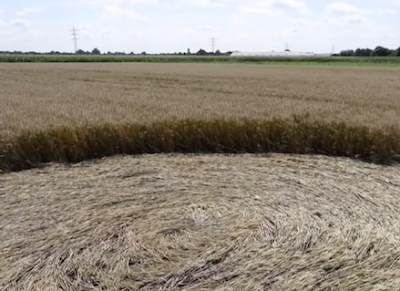 Crop Circle In Hoeven, Netherlands Shows Signs Of UFO Landing, July 2015, UFO Sighting News. This crop circle caught my attention over others. Not because of its well flattened stalks of grain, but its simplicity. Yes, when a person goes out to make a crop circle, they make all these intricate patterns, but they don't just keep it simple. This is the reason I believe this is real. Look at the tightness of the stalks that are bent. They almost looked glued down. Something big and heavy landed here the night before. What I wouldn't give to see that.